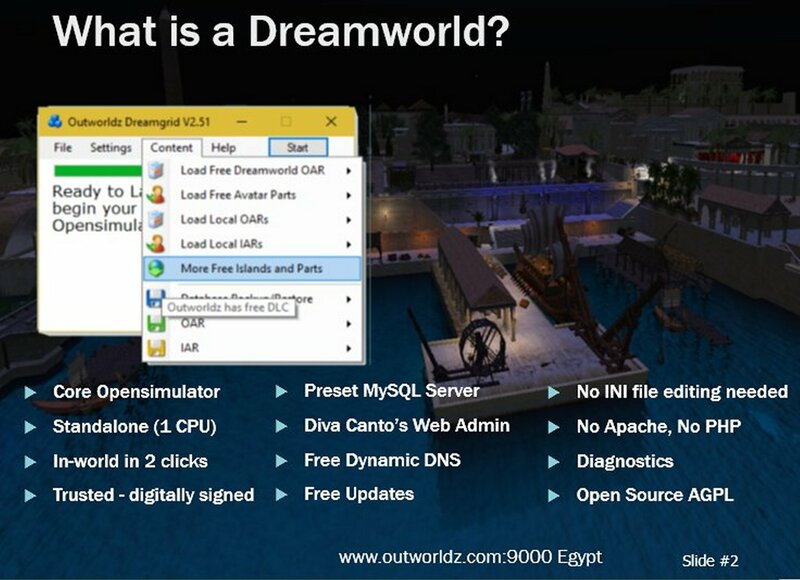 Two years ago I released a version of Dreamworld, which is a standalone version of Opensim made easier to install and run. A year ago, I spoke about the new Dreamgrid beta here at OSCC2017. Today I’ll to show some of the new features introduced over the last year, along with a few of stats. And talk about a few things in the works that might get done in 2019. First, a bit about Dreamworld. 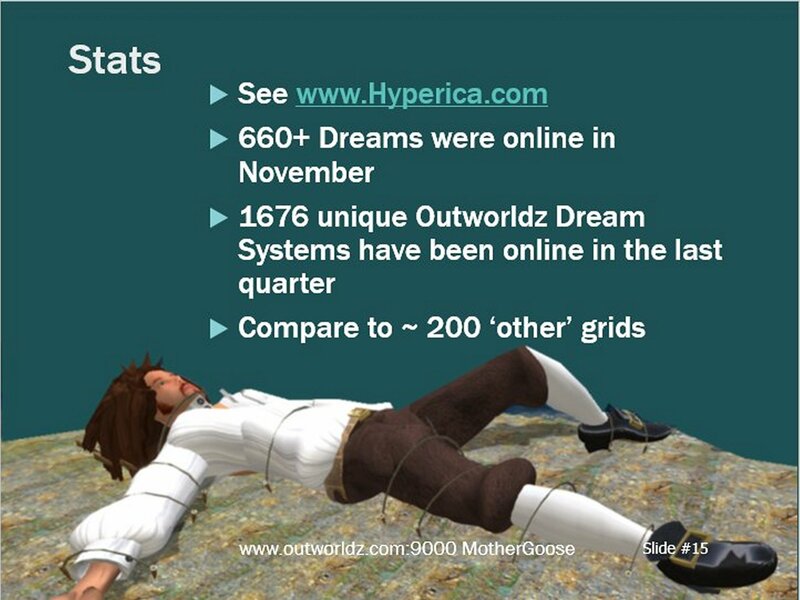 Dreamworld's goal as a standalone grid was to make it much easier to use than the stock Opensim installation method. Opensim is a kit of parts, and the main grids out there all modify it by using PHP and Apache Web servers and lots of custom code to suit their needs. I don’t use PHP or Apache and make no changes at all to Opensim core code. 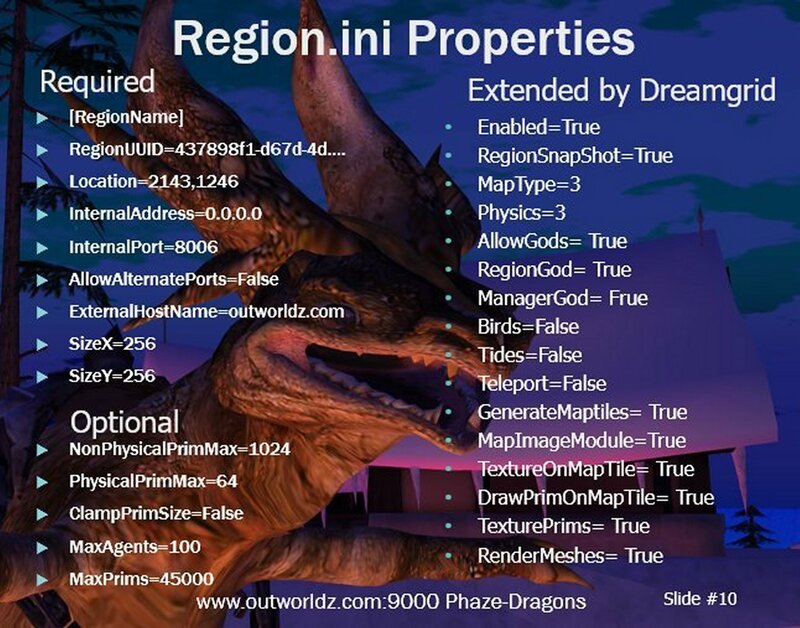 Both Dreamworld and Dreamgrid are 100% core Opensim as I use standard Dot Net code, like Opensim uses, to extend it externally. It can still do a lot of things for you. They both setup and start core Opensimulator code in a few clicks. Dreamgrid edits over 250 different INI settings on startup. It tries to set everything to work first time, including the Hypergrid. The main difference between the original Dreamworld and the Dreamgrid is expandability, faster boot and more flexible region control. You can have many DOS boxes running one or more regions, and can easily create, start, and stop them individually. 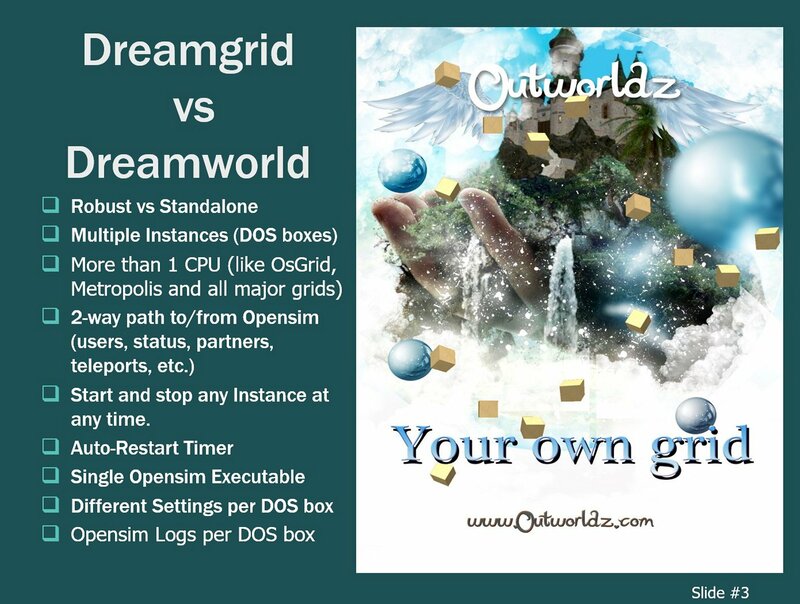 Dreamgrid is also much more integrated into Opensimulator by 2-ways paths. 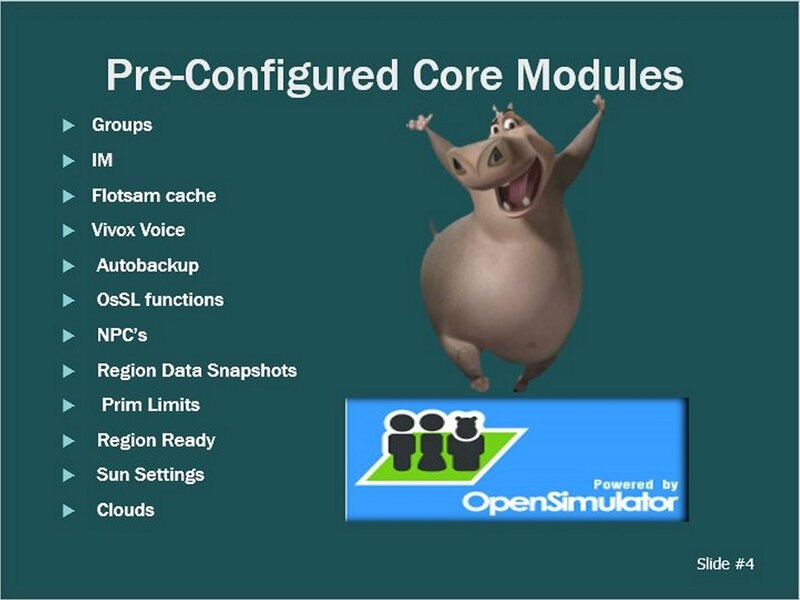 No code has been changed in core Opensim, it just uses existing methods such as HTTP, Region modules, and in ways we have had access to for many years. It comes with the obvious core modules already enabled and tested for Groups, IM and so on, along with control panels for things like Vivox Voice to make it easy to get the license keys for non-commercial use. I’ve also added many features that are not well documented. For example. Autobackup module is a core module, but not normally used as it’s not included in Opensim.ini by default. I try to put all the core features I know of in. OsSL functions are set up to sane values for NPC’s and other common items like the Aine Caoimhe (aːnʲə kee + va) dance ball. Data Snapshots which collect prims “marked for Search”. MAXPRIMS Prim Limits module can be enabled or disabled with a click. 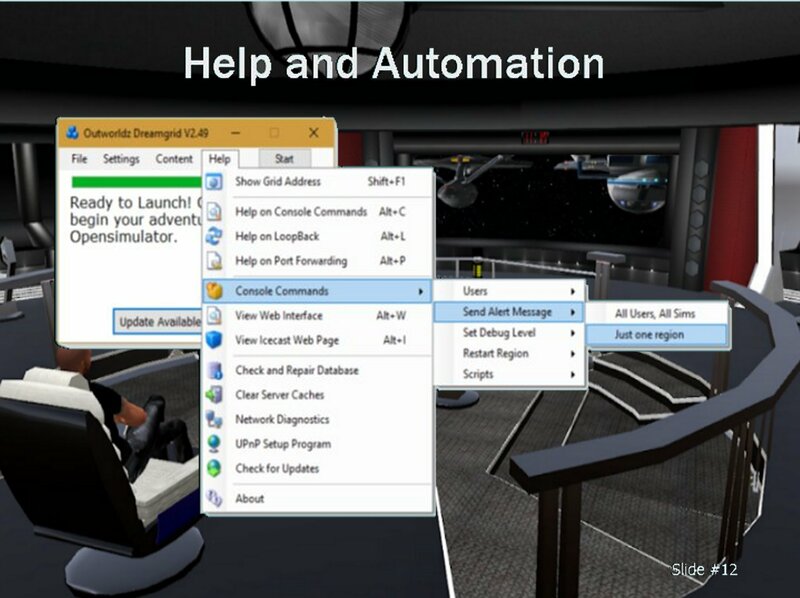 Region Ready module knows when a sim is on or offline and changes the Dreamgrid icons and state. I also have little used core modules such as Sun and the old particle Clouds. I’ll show some of these on the next few slides. 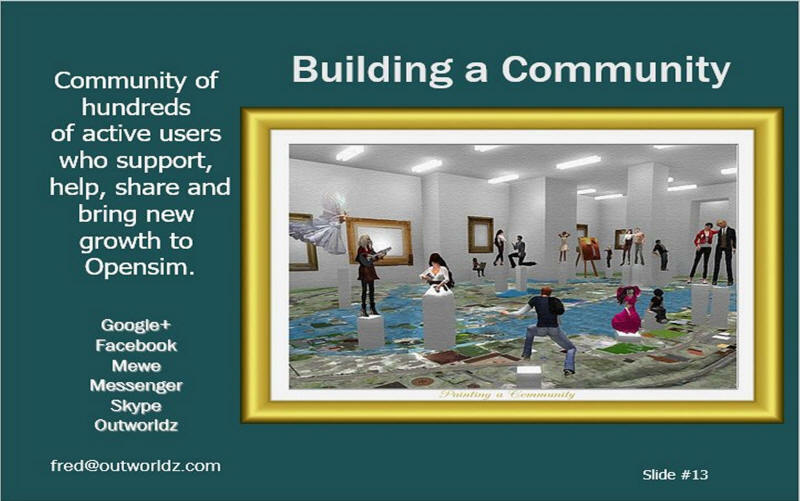 Partnering is a simple prim with a Opensim back-end that lets two people partner in the viewer, like Second Life has. All you have to do is upload the prim from the Load Local IAR menu and you are ready to go. Gloebits has a setup menu that makes it a easier to navigate the Gloebits setup procedure. There is a built-in IceCast server that can take Mixx, Winamp, or any other audio broadcaster. Your grid can host singers and musicians and broadcast your own music stream. This also works in Second Life or as a general purpose stand-alone radio station. There are some new In-viewer effects, too. 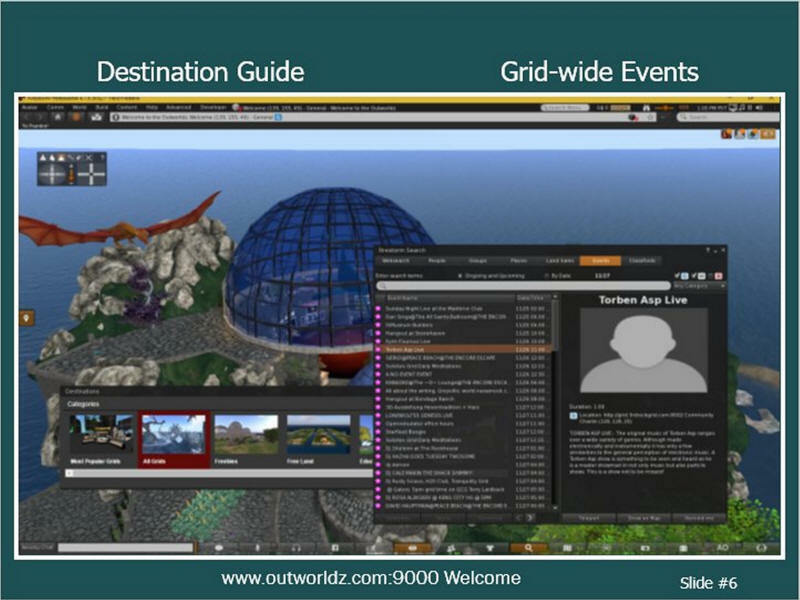 The Destination Guide lists known online Opensim grids, of any type, with search and sorting. It automatically collects grid information and online/offline status with a web crawler every hour. It is also available at www.hyperica.com and in world via various open source signs and HUDS you can get from Outworldz. I plan on expanding this area a lot more in the near future. Dreamgrid has the Data Snapshot module in it. If you enable it, more information will be populated on other tabs soon. Bird module lets you make up flocks of birds on a per-region basis. This works best on flat, small regions. Tides raises and lowers the water level. It comes with a buoy and scripts to make your boats and water plants and waves move up and down with the tides. The Auto Updating teleport system can be enabled or disabled for any region with a click. It shows up to 32 regions in this clickable sign. There is also a HUD version that makes it easy to navigate around whatever Dreamgrid you are in. You enable it in the Region settings, upload the sign from the Load Local IAR menu, and rez it. The big difference between Dreamworld and Dreamgrid is this panel. 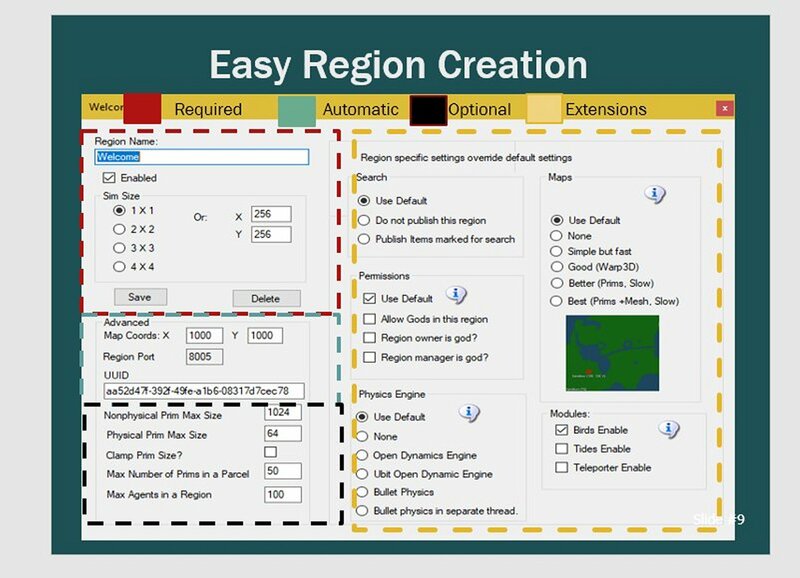 You can add, delete, and modify any region easily. The icons change to show regions that are disable, starting, stopped or running. This is also used by the Auto restart program in Dreamgrid that periodically reboots regions with no avatars in them. Suppose you need to reboot the sim you are in. 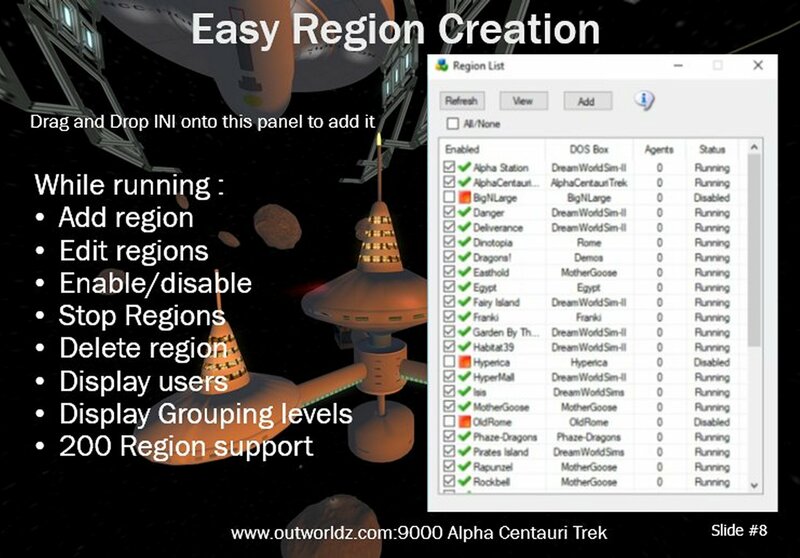 Simply teleport to a different region, open this panel, and click the region to stop it. It will shut down gracefully. Another click will restart it. 200 regions is an internal structure limit. By the way, there are people running over one hundred regions on a single PC quite nicely. Red is all you really need to fill in. Give it a name, Enable it, and choose the size. Then click Save. It has error checking in it so its hard to go wrong. The black box below that is not normally included in Region INI files. I always include it, and fill it in with sane defaults. This includes MAXPRIMS, which can be globally enabled or disabled, which is the default. The yellow area on the right are Dreamgrid-specific extensions. 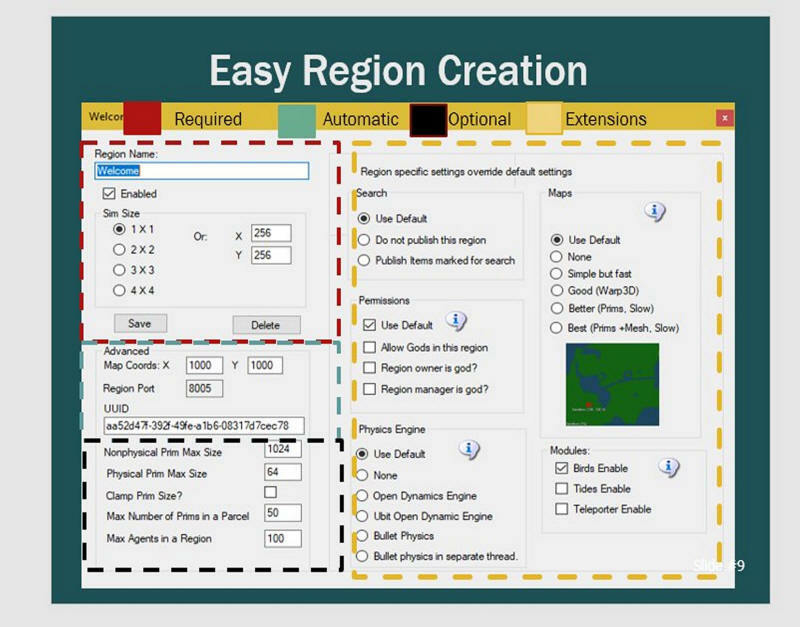 It lets you set some key things up on a per-region basis. For example, some regions can run Ubit ODE and others regionsvcan run Bullet. I find it very handy to adjust the map settings from some reasons to high, then turn it off for most sims that never change. The maps will still be there. This is a look at the settings as used in Dreamgrid in each INI. Blank values are allowed for the “Extended by Dreamgrid” column. This column on the right is added without any changes to core. So this all sounds great, but what happens when it won’t work? 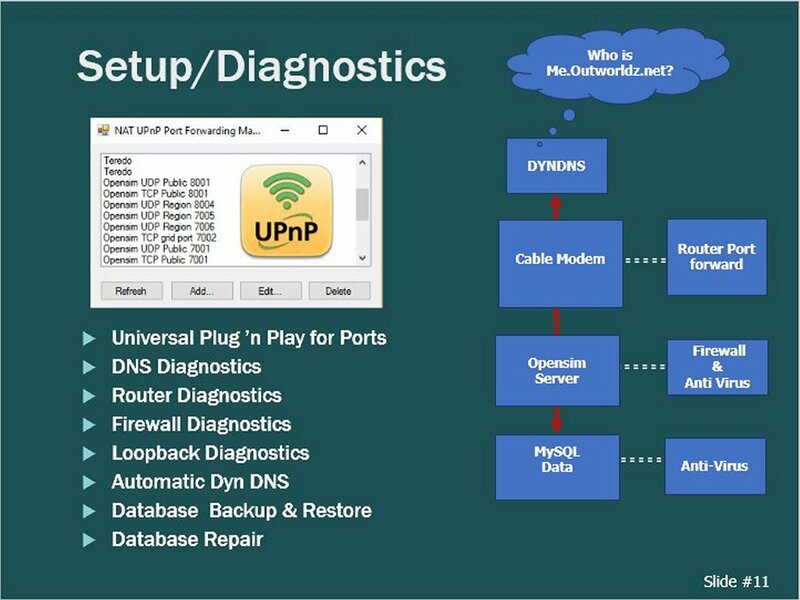 I have two kinds of Universal Plug and Play, also known as “Plug and Pray”, which sometimes works to forward the correct ports so Hypergrid immediately works. It works great on my Linksys router. But a lot of times, for no good reasons I can find, it doesn’t. So Dreamgrid has diagnostics to find out what you need to do to fix things, such as opening ports. We all know Hypergrid does not always work so my internal and external diagnostics are run to sort things out. On the right are some of the areas things can go wrong. For example, starting at the top, if Hypergrid is working, you get a Dynamic DNS address, If not, you get a known working LAN IP. For example, many routers don’t loopback or do it wrong. There are two solutions: the etc/hosts DNS change, which works but limits you to one PC and you can’t log into other grids and then teleport to yours. The other method is the Windows Loopback driver, which works great, but requires manual changes if your public IP changes. I have it on my to-do list to automate this simple task so one more thing that can break goes away. You probably have to have firewall setting changed, and many Anti Virus programs hate MySQL the Script Engines folder. I also personally compile from Opensimulator source code and digitally sign all DLLS and Exes so Windows trusts the code. 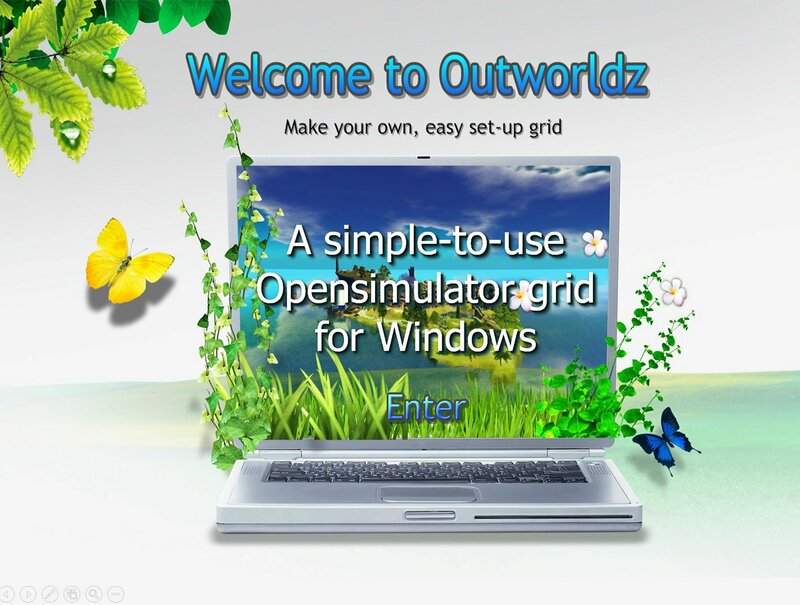 The web site links in Help point to the Console section at the Opensimulator wiki, and some Outworldz pages specific to Dreamgrid. I also automate many common Opensim commands, such as this example for the very simple ‘alert’ console command. There are links that automatically point to your “Diva Canto” Wifi Admin page, IceCast web page, and to your grid. Dreamgrid also automates MySQL setup, and writes custom batch files specific to your installation that diagnose and repair issues that seem to occur far too often. You can also clear all the server caches, without destroying the script states. I have gotten a lot of great feedback from hundreds of people. I want to give my thanks to the everyone who participate in the Opensimulator Dreamworld community on Google Plus, Outworldz, Facebook, Twitter and on MeWe. 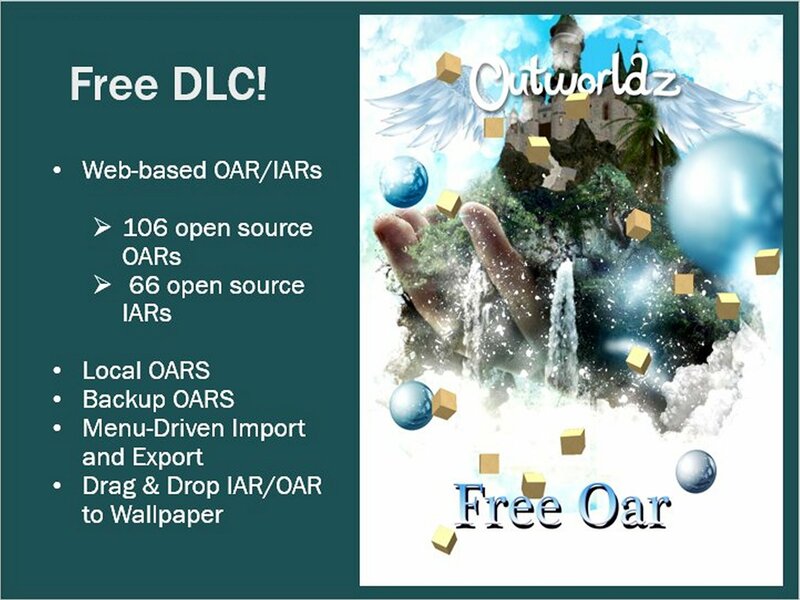 Thanks to all of you, we now have 108 Open source OARS, and 66 IARs for anyone to use. These load over the web with a few clicks. Dreamgrid also makes it a much easier to load and save these types of backups, in multiple ways. You can easily browse to and load an Autobackup OAR or IAR. It prompts you for the details, and types in the commands for you. You can also drag and drop a file on the Dreamgrid wallpaper. I collect a few anonymous stats from your Dreamworld. These are sent via HTTPS and saved anonymously. Dynamic DNS entries alone counted for 1676 unique systems last quarter alone. 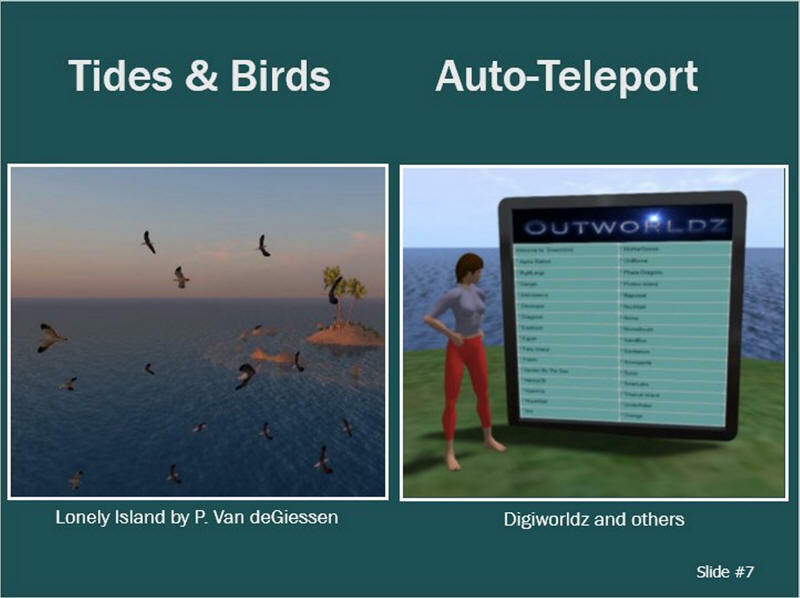 This excludes private, and LAN–only systems without Hypergrid. Destination Guide Auto Update will put your grid and regions as the first entry when people are on your grid. Add the Concierge which module announces visitor entry and exit in your region. Themes for Diva’s Web Panel – Black versus White modes with settable images. Fixing some of the broken and missing Diva things –the Male and Neutral avatar don’t work, and add code to the TOS module to support full grids. IAR/OAR export for Web Panel - adding a form, authorization, and the code to type the right commands into the consoles. Dreamgrid-wide Search – Opensim and Server side is working and collecting data. Search engine needs more work. Tabbed DOS boxes – Partly working, will help organize large sims by reducing clutter. Boot On Teleport – The big goal, partly implemented to let you turn off all but one region, and still travel to all of them by intercepting tp requests and spinning up sims on demand. 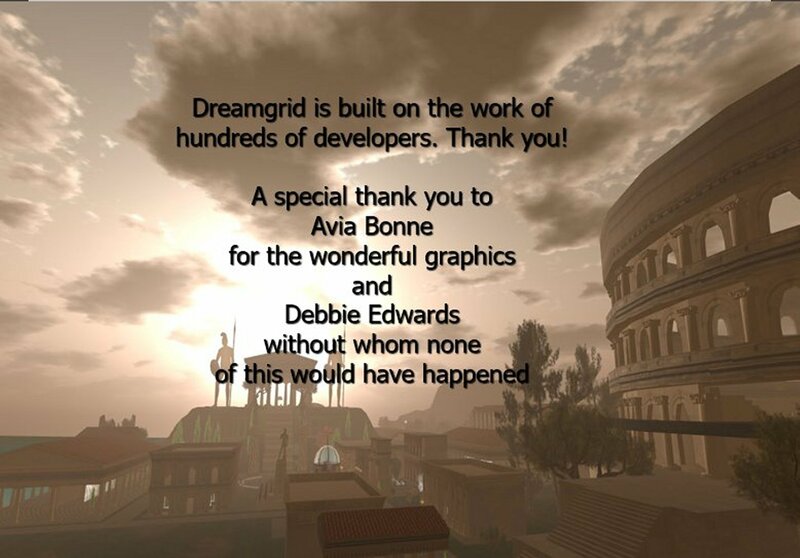 Dreamgrid is built on the work of hundreds of developers. Thank you all, Ubi Umarov, Diva Canto, Mr. Blue and all the hundreds of others who have contributed so much of their time. Wait! There are many more Free Tools, Tricks and Tips in part 2!